Environmental challenges can be very complicated. Making the right decisions on construction projects can be complex. The team of CSI Environmental and CSI Construction simplifies this process and facilitates turnkey solutions. Finding sustainable solutions requires active collaboration, interdisciplinary expertise, and a partner with the depth of experience in the integrated services necessary to solve your unique environmental and construction challenges. For 30 years, CSI Environmental and Construction have delivered safe, cost-effective, and legally compliant solutions for its clients–improving land quality, redeveloping existing or new sites while restoring the health of our natural environments. With over three decades of experience, CSI is able to efficiently identify the source of your environmental challenge; develop a cost-effective solution; and provide you with the detailed project assessment you need to make solid business decisions. Our extensive fleet of construction equipment and experienced staff of supervisors, foreman, construction managers, equipment operators, and technicians, work with our expert team to bring you a one source solution and comprehensive construction services. 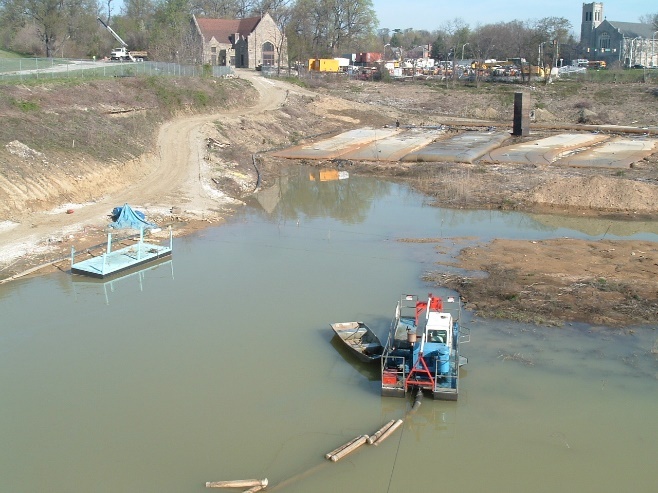 Our dredging and dewatering services include 3D-Geotextile and Advanced Polymer Systems (3D-GAPS)–the most cost effective system for dewatering contaminated solids and reducing volume requiring disposal.